Victor Murillo was killed in an accident on SH 85 and FM 140 west of Charlotte Friday Morning. Murillo drifted into oncoming traffic, colliding with Bobby Cardwell who was driving a white pickup. 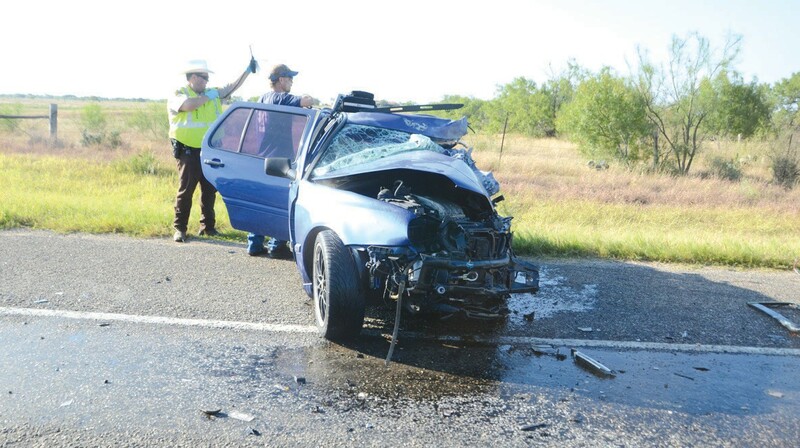 A car was t-boned by a pickup truck at the intersection of FM 140 and SH 85 west of Charlotte Friday morning around 8:20 a.m.
Victor Murillo of Von Ormy, Texas was driving his 1998 Volkswagen Jetta east on SH 85. Bobby Cardwell was driving a white extended cab pickup; the make and model are not known due to the extent of fire damage. Murillo’s Volkswagen drifted across the double yellow line and into oncoming traffic. The impact of the resulting crash crushed the side of Murillo’s car. Murillo succumbed to his injuries an hour after the crash around 9 a.m.
Cardwell’s truck went off SH 85, and through a fence. Bobby Cardwell was severely injured and taken to South Texas Regional Hospital in Jourdanton by EMS crews. It was shortly after Cardwell was taken away that his truck caught on fire. Murillo’s body was taken to Hurley Funeral home in Pleasanton.